Stop. Look. Listen. These are important words of advice if you want to keep your compressed air system running in a trouble-free manner, and at the lowest possible cost. The key to a successfully running system is careful observation of various important parameters and conditions in the compressor room and in the facility. So often the attention paid to an air compressor or system is during a reaction to a problem, but the trouble-free operation of an air system requires proactive maintenance and constant repair. Stop – Shutting off your compressed air system during nights and weekends, or during non-productive periods saves energy. Turning off your air compressors allows a quiet time where you can observe some potential trouble for your compressor and your pocketbook. It is good to observe how fast the system pressure drops when the compressor is turned off. An immediate drop of 5 psi or more signals a high pressure drop in dryers, filters, and piping. You may need to do something to reduce compressor operating costs. A very slow pressure drop a few seconds after the compressor turns off shows your level of leaks and the relative size of your storage receivers. If your system pressure crashes more than 20 psi in a minute, with no production machines running, you may have high leakage or a lack of proper system storage. Look – This is a pretty tall order, but look in the compressor operating manual and find the maintenance requirements. Observe the compressor hour meters and see if you have been changing lubricant and filters in a timely manner. In air compressors, the lubricant receives harsh treatment, worse than typical machinery. Changing lubricant regularly is very important, or you risk future mechanical problems. Check all filter indicators and pressure gauges to ensure no high pressure differentials exist. Observe condensate drains—the drains in the compressor, receivers, air dryer, and filters. These need to be working to ensure high quality air enters the plant. Also, check the general compressor room area. Clean any high levels of debris that may restrict ventilation or get caught in compressor ventilation passages. Ensure primary filtration, if included in the room ventilation system, is clean and free of restrictions. Listen – A big driver of compressed air costs is system leakage. Starting in the compressor room, listen for leakage just after the compressor has been turned off. 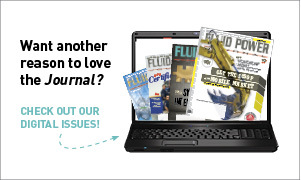 Are big leaks robbing you of your compressor capacity? Then, with the compressor back on, walk through the plant during quiet times of non-production listening for leakage, making sure to note leakage points for later repair. 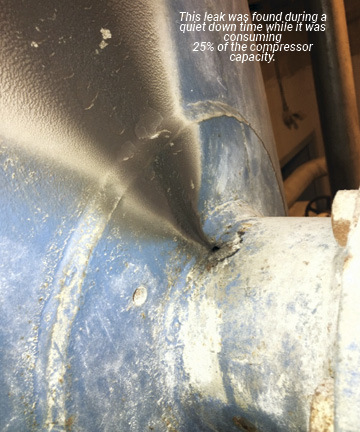 Often 30% or more of compressed air costs will be caused by leakage. Best bet is to purchase an ultrasonic leak detector and use it regularly to keep your leakage levels under 10% of your compressor capacity or lower. Properly following this advice will help keep your compressed air system running in a reliable and cost effective manner. Ron Marshall is owner of Marshall Compressed Air Consulting, a company that specializes in compressed air efficiency assessments.Visit www.compressedairaudit.com.